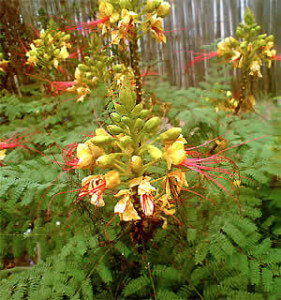 Baja Fairy Duster is a medium sized shrub that grows to 5 feet high and 5 feet wide. 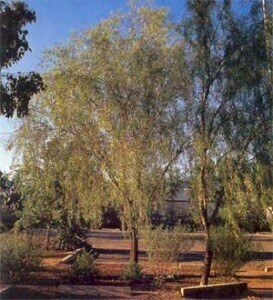 Medium green, twice divided leaves are one inch long and give this native of Baja California its tropical appearance. Scarlet red to red-orange, tufted flowers appear nearly year-round. Flowering is most prevalent from November to March with intermittent blooming during the summer. The long red stamens of these flowers resemble the tufted head of a dusting brush. It strongly attracts hummingbirds which are very territorial about this plant. 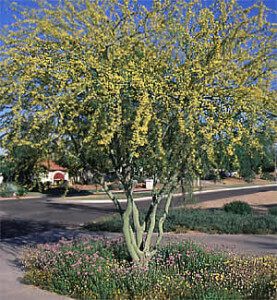 Baja Fairy Duster makes a beautiful addition to any xeric landscape where year-round color and low maintenance are desired. Baja Fairy Duster should be planted in full sun. It also handles partial sun and reflected heat extremely well. 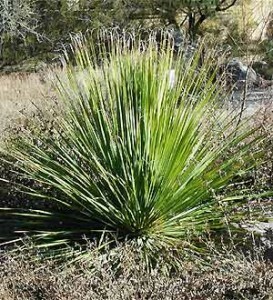 It tolerates most desert soils in Southern Arizona, though well-drained, drier soils are best. 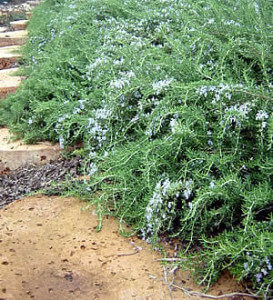 This xeric shrub requires little water but will grow and flower more with regular irrigations in summer. Water established Baja Fairy Duster every two weeks in the summer; every month or two in the winter. It responds well to a thorough soaking every 2 to 3 weeks as the weather turns warm in spring and summer. Don't heavily prune or hedge Baja Fairy Duster. Only head back individual stems and branches in the early summer to promote a full canopy of foliage.